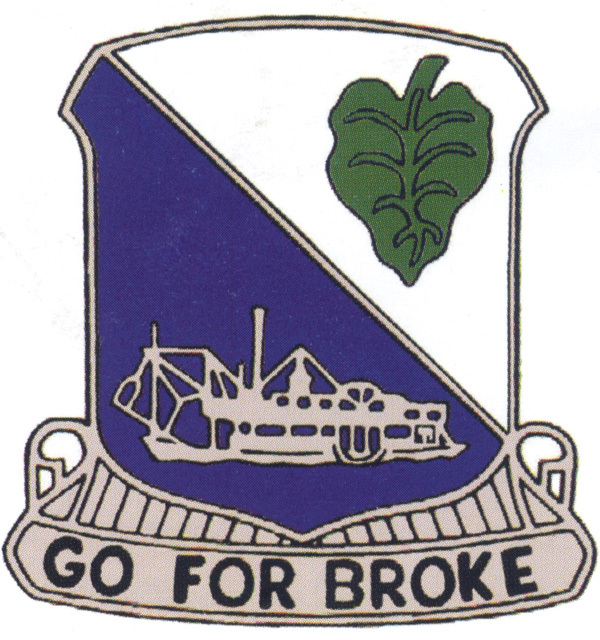 The 442nd Regimental Combat Team, which included the 100th Infantry Battalion, was deactivated in Honolulu in August 1946. Almost a year later, it was reactivated in the United States Army Reserves, the first such unit to be established in Hawaii. Between July 1947 and May 1968, the unit went through several organizational changes, from regimental to battle group, ending in its current battalion structure. During the Korean War in the early 1950s, the battalion provided replacement personnel. It was mobilized in 1968 during the Vietnam War to provide individual replacements and used as a strategic reserve unit. Twelve soldiers were killed in action. Today, the 100th Battalion, 442nd Infantry, is the only infantry unit in the Army Reserves. With headquarters at Fort Shafter in Honolulu, Hawaii, it is part of the 9th Mission Support Command and has the responsibility of maintaining a maximum state of readiness in the event it is needed in a combat zone. The battalion has units on the south Pacific islands of American Samoa, Guam, and Saipan and in Hilo, Hawaii. In August 2004, the battalion was mobilized for duty in Iraq and stationed 50 miles northwest of Baghdad at Logistical Support Area Anaconda. During its tour of duty, four soldiers were killed in action before the unit returned to Hawaii in January 2006. One platoon in Charlie Company had outstanding success in discovering and destroying over 50 large weapons caches containing mortars, ammunition, and rockets. The battalion was again deployed in 2009 to Kuwait and Iraq, performing over 1500 combat missions covering 1.3 million miles of roads. Before returning to Hawaii in August 2009, the battalion lost two soldiers. 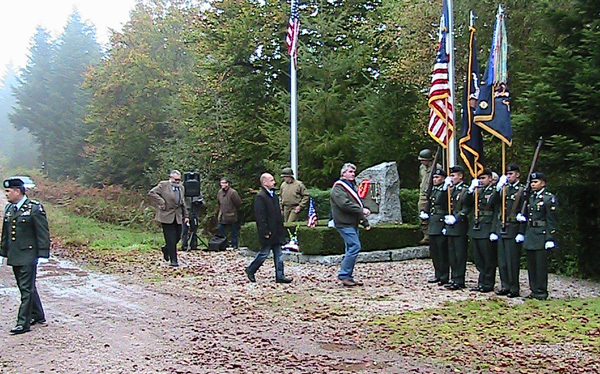 The legacy of the 100th Infantry Battalion and the 442nd Regimental Combat Team continues to this day. 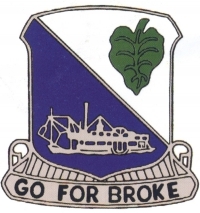 The present day battalion incorporates the two insignias of the 100th and the 442nd: the first is a variation of the original 100th Battalion insignia, and the second is that of the original 442nd RCT with its “Go for Broke” motto. Its soldiers come from different states and the south Pacific Islands and no longer are primarily of Japanese descent. Soldiers in the battalion are told of the proud tradition they are upholding and participate in events to honor the veterans from World War II. They provide honor guards for ceremonies and memorial services. In addition, they also attend full honor funerals, visit sick veterans at home, provide transportation and escorts, and coordinate special events. In addition to helping with maintenance, soldiers also hang out and “talk story” with the veterans at the clubhouse. 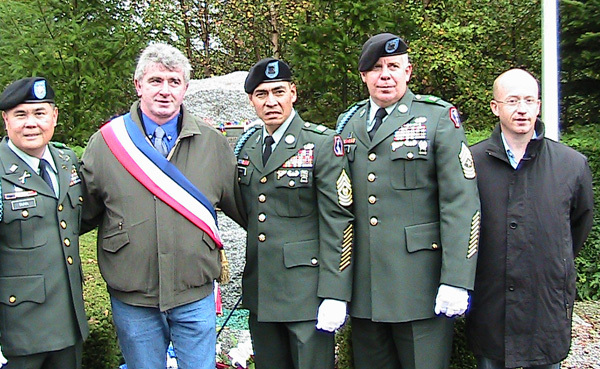 For several years, soldiers of the battalion have travelled to France to participate in ceremonies commemorating the October 1944 liberation of Bruyeres and Biffontaine by the soldiers of the 100th Infantry Battalion and 442nd Regimental Combat Team. These photographs were taken during their October 2010 trip.